Stel je voor: je gaat shoppen in de Abou Jihad straat in Ramallah, genoemd naar het brein achter de dodelijkste buskaping ooit in Israël, je bent leerling van de Shahid (= martelaar) Sadam Hoessein school in Yaabad (Westbank), je neemt deel aan een jeugdvoetbaltoernooi in Tulkarem ter nagedachtenis van Abd Al-Basset, een terrorist die in 2002 op de Joodse Sederavond 31 burgers doodde, of je behaalt een gouden medaille op het Abu Iyad schermkampioenschap, genoemd naar de man die de dodelijke aanslag beraamde op het Israëlisch dorp tijdens de Olympische Spelen van München in 1972. Dagelijkse realiteit in Palestina? Palestinian Media Watch onderzocht dit fenomeen en bracht hierover in mei 2010 een rapport uit, From Terrorists to Role Models: the Palestinian Authority's Institutionalization of Incitement. Savasorda stelt het voor. Deze informatie is algemeen beschikbaar en bekend bij de media, en toch gaat het maar over een ding: de bouw in de nederzettingen en het einde van de bouwstop. Alle andere obstakels worden vergeten, verzwegen, genegeerd. Terwijl we toch in een vrij land leven. Een paar weken geleden kwam de Times met een idioot en suggestief artikel over dat Israeli's liever in de zon liggen en geld uitgeven dan dat ze zich bezig houden met het conflict met de Palestijnen. In de Globalpost wijst Matt Beynon Rees erop dat je precies zo'n verhaal kunt maken over de Palestijnen in Ramallah, waar de ene club na de andere de grond uit schiet, en zelfs in Gaza zijn er tegenwoordig luxe winkelcentra, clubs en hotels waar mensen het ervan nemen. Hij wijst er verder op dat het alleszins begrijpelijk is dat mensen aan beide kanten niet met leven willen wachten totdat er vrede is. Of course, it's always dangerous for a journalist to suggest that someone "doesn't care." In the Middle East, that person is most likely to be engaged in something else when he chats with the reporter, but just as easily could be sprung back into caring deeply as soon as violence erupts. Mensen zetten zich vaak op hun eigen manier in voor vrede en verzoening, of reageren op ad hoc situaties. Zo kunnen vele duizenden mensen de straat op gaan voor een concrete zaak, een oproep ondersteunen of geld geven of zelfs met gevaar voor eigen leven iemand helpen. Israeli's reageren zeer alert op mogelijk gevaar en wachten niet af zoals je hier weleens ziet. Palestinians and Israelis want peace. The Time article picked up rather on the fact that both peoples are sick of the energy it takes to follow these frequently pointless talks. To some, that looks like a lack of desire for peace. I'd call it a reflection of the fact that everyone knows what sort of peace deal could be achieved, if only the politicians would put away their fears of being condemned by their own extremists. Dat klinkt iets te simpel. Een meerderheid van de Israeli's wil een einde aan de bezetting, maar wel een zekere controle houden over de toekomstige Palestijnse staat, en de grote nederzettingenblokken houden. Over de vraag of Jeruzalem een gedeelde hoofdstad kan worden is men op zijn best verdeeld. Een meerderheid van de Palestijnen is tegen een tweestatenoplossing in de zin van twee staten voor twee volken, is tegen een gedeeld Jeruzalem en vindt dat miljoenen nakomelingen van de vluchtelingen moeten kunnen terugkeren naar Israel. Zie bijvoorbeeld deze recente enquete. Analysis: Many Israelis and Palestinians live as if peace has already arrived. Editor's note: In an address to the United Nations General Assembly today, U.S. President Barack Obama urged support for the Israeli-Palestinian peace negotiations currently underway. JERUSALEM — Ariel Sharon, who went into a coma almost five years ago, is soon to be moved from his hospital bed to his ranch on the edge of the Negev Desert. If he came out of his coma (his doctors say he never will), the former Israeli prime minister could be forgiven for thinking peace had been made in the years that he lay in Sheba Medical Center near Tel Aviv. A recent Time magazine cover bore a daisy chain Star of David and the headline: "Why Israel doesn't care about peace." The story inside detailed how Israelis were too busy drinking at bars, eating at restaurants and sunning themselves on the beach to care about the peace talks which are just under way. The author could've just as easily zipped along to the Palestinian town of Ramallah, which abuts Jerusalem to the north, and pulled together a similar story. The city's nightlife has exploded in the last year or so with new clubs and bars opening each month. It isn't just United Nations workers who frequent the fusion restaurant called Orjuwan or the painfully loud dance floor at SnowBar, just down the road from the refugee camps and across the street from Yasser Arafat's tomb. These are young, wealthy Palestinians who are living as though Ibiza came to the West Bank. What Sharon would soon figure out — because he was nothing if not shrewd — is that some Israelis and Palestinians are tired of waiting for peace to be negotiated and have decided to live as if there already were peace. I've been in Jerusalem since 1996. All the recent headlines about "freezing settlement building" or "security control over holy sites" are repetitious to the point of utter inanity. A revived Sharon would probably think he'd actually gone back in time to Benjamin Netanyahu's first term as prime minister in the late-1990s, when negotiations crawled along at a desperately dull pace. What I've observed lately is that Israelis and Palestinians are as tired of living through peace negotiations as I am of writing about them. Of course, it's always dangerous for a journalist to suggest that someone "doesn't care." In the Middle East, that person is most likely to be engaged in something else when he chats with the reporter, but just as easily could be sprung back into caring deeply as soon as violence erupts. The Palestinians rioting in East Jerusalem Wednesday, for example, after violence on the Temple Mount, appeared to care about something. Either that or they just wanted to throw some stones and work up a sweat, which is another cause for rioting that journalists often overlook — teenage male testosterone. The focus of most journalists is, in fact, those very extremists. They cause the most damage and make the loudest noise. They're not the majority. That's what makes them powerful, too. When most of the people around them are keen to live as if there were peace — as if those extremists didn't exist — then the power to change events lies with the extremists. They know there's not peace; they don't have to pretend. That's why a relatively small number of settlement activists are able to drag the Israeli government toward a renewed expansion of its colonies in the West Bank, which may cripple the new negotiations almost before they've begun. In the same way, it's Hamas in the Gaza Strip, not the U.S.-backed Fatah in Ramallah clubland, which dictates how far Palestinian leaders are able to go in their talks with Israel. Coming out of his coma, Sharon would recognize that situation. In the Middle East, some things don't change. Barry Rubin is niet zo optimistisch als Bradley Burston over de kansen voor de vredesonderhandelingen tussen Netanjahoe en Abbas, maar zijn zorgen klinken legitiem. Voor veel Israeli's is niet het vasthouden van het land op de Westelijke Jordaanoever als deel van 'historisch Israel' van belang, maar het risico dat als ze dit gebied opgeven, er een vijandige staat wordt gevestigd die meer bedreigend is voor Israel dan de huidige situatie. De huidige situatie is op den duur onhoudbaar, maar zijn er genoeg garanties te geven dat de tweestatenoplossing wel tot een duurzame vrede leidt? A Future History of Palestine: You Want a Two-State Solution? Then Do It Right. A gala celebration marks Palestine's day of independence. Some world leaders come bearing promises of financial aid. Arab leaders attending offer little money and, except for Egypt's president and Jordan's king, avoid contact with Israel's delegation. These celebrations are marred by the absence of leaders from countries--including Iran, Syria, Libya, Sudan, and Yemen. refusing to recognize the new state. Hamas, ruling the Gaza Strip, along with Islamic Jihad and other Palestinian groups, also reject the "traitorous entity." Gaza's rulers mark the occasion by firing rockets into Israel. Palestine's president boasts hollowly that his country includes all of the Gaza Strip but controls nothing there. Hardly any of the Western media cover statements by some leaders of Palestine's ruling Fatah group that the new country's independence is not the conflict's end but the first step toward total victory and conquest of Israel. Nor do many note statements of Islamist and Palestinian nationalist Arab groups among Israel's citizens that they now seek to dismantle the Zionist nature of the Israeli state, a goal several European newspapers endorse. Nor is it widely highlighted in the Western media that the new country officially proclaims itself an Arab and Muslim state while ridiculing the idea of accepting Israel as a Jewish state. Within a few weeks, infiltrators--some from Hamas, some from Fatah--cross the Palestine-Israel border to attack Israeli motorists and farming villages, set fires, and engage in sabotage. Palestine's government loudly condemns the attacks and claims it is trying to stop them. But the attacks continue even though a few Hamas supporters are rounded up, beaten up, and briefly imprisoned. Soon, the official Museum of Palestinian History opens with exhibits claiming all of Israel as rightfully part of Palestine. Visiting schoolchildren are told that Tel Aviv, Haifa, Beersheva, and the rest of Israel belong to them and will some day be part of Palestine. Big displays show alleged Israeli atrocities and extol heroes who'd blown themselves up killing many Israeli civilians. Yet these things, along with anti-Israel incitement in the Palestinian media, mosques, and textbooks, attract little foreign attention. The conflict is over, isn't it? And to publicize such facts, journalists tell each other, would only "play into the hands of Israeli hardliners" and "undermine peace." Israel, of course, protests the incitement and armed attacks to the UN and Western governments, but those diplomatic efforts bring no response. Israel steps up defenses and builds a border fence at great expense, which helps somewhat. Yet every time Israeli patrols fire on infiltrators trying to get across, Palestine protests--backed by Muslim-majority states—that this is unprovoked Israeli aggression. In the Middle East, the peace agreement brings little change. True, in some countries hatred toward Israel diminishes a bit. But Syria is still uninterested in peace. Moreover, growing fear of a nuclear Iran, Syria, and revolutionary Islamist groups intimidates other Arab states from making peace with Israel. After all, they say, now that there's a state of Palestine they don't need to do so. Islamist groups rally against the "treasonous" Palestinian regime and "sell-out" of Palestine to recruit new members. America is no more popular for having fathered a Palestinian state since that birth required concessions and didn't bring all the land under Muslim rule. Violent attacks against U.S., European, and occasionally Palestinian institutions take place in a half-dozen countries. --Growing border tension and cross-border attacks lead to Israeli incursions to fight terrorists against whom the Palestinian government doesn't act effectively. This sets off a crisis in which Israel is branded as the aggressor that is threatening peace and some call for sanctions against it. --A coup takes place turning Palestine into a military-run regime which might be either more militant, wanting to fight Israel, or more cautious, seeking to crush Hamas. --As a result of tensions with Israel, internal conflicts, a radical regime, or coup, the Palestinian government obtains military equipment, including advanced anti-aircraft missiles, violating the peace agreement. What's the world going to do to enforce that treaty? Probably very little. --As a result of the list of scenarios given in the previous paragraph, the Palestinian government calls in foreign troops, possibly Syrian or Iranian. What's the world going to do about that? How would the world respond to Israel taking military action against such threats and treaty violations? --A Hamas coup, far more likely to happen than the Palestinian government conquering the Gaza Strip, produces a pro-Tehran Hamas regime which, perhaps partnered with militant Fatah leaders, tears up the peace agreement and announces an alliance with Iran, making Israel and Western strategic interests worse off than ever. Of course, we can also assume everything goes well and everyone lives happily ever after, that Palestinians become interested only in raising their living standards and keeping things quiet. That might happen. But while the above scenarios are speculative they are better rooted in experience and reality than is the "best-case" alternative. At any rate, betting the lives of millions of people, Israel's future, and Western strategic interests must be based on something better than wishful thinking and refusing to acknowledge the threats involved. Tell me, if you can, how the above predictions are ridiculously unlikely or impossible. The only likely response is: Shut up! You are endangering the possibility of peace! Have you ever seen serious discussion of any of these points from Western experts, media, or governments? Is there any sign of steps being taken to avoid such outcomes in the Western approach to the issue? O course, this is all hypothetical. In practice, the Palestinian Authority isn't going to make peace for many years to come. While many would read this article as reason to oppose any two-state solution altogether. I, like most Israelis, favor a two-state solution if done properly. Yet if no one takes these dangers seriously, why should Israel make concessions, take risks, and rush into such a situation where it would be very likely worse off than it is now? All we are saying is to give peace a chance. But only if it is likely to be a peace that is lasting and better than the status quo for all concerned. Verslaggevers in Israel en andere zogenaamde deskundigen wijzen graag op de macht van de kolonisten in Israel en stellen Netanjahoe als een rechtse havik voor. Ook het Israelische publiek zou geen echte concessies willen doen en vasthouden aan 'Judea en Samaria'. In werkelijkheid is een meerderheid van het Israelische publiek voor terugtrekking uit het merendeel van de Westoever en een einde aan de bezetting. Men is huiverig voor Palestijnse soevereiniteit vanwege het gevaar dat Hamas de macht zal overnemen en de Westoever net als Gaza en Zuid-Libanon vol zal worden gezet met raketten. Dat, en niet Gods belofte aan Abraham of vermeende Joodse superioriteit, heeft Netanjahoe relatief veel zetels gegeven en een rechtsere regering mogelijk gemaakt. Maar ook Netanjahoe is pragmatischer dan men hier wil zien. Terwijl men zijn best doet om uitspraken van Hamas (en andere Palestijnse leiders) zo gematigd mogelijk uit te leggen, ziet men de werkelijke ideologische verandering van Netanjahoe geheel over het hoofd. Settler leaders have also suggested that the movement's will to resist such a change is much diminished since the Gaza disengagement. Senior Yesha official Shaul Goldstein remarked at the outset of the settlement freeze that most settlers were too "moderate" to take off from jobs to attend protests, even though he said the freeze "means that life might stop." Most daunting to the settlers and their supporters is the fear that Benjamin Netanyahu may opt to follow in the paths of hawkish Likud founders Sharon and Menachem Begin, and launch a landmark withdrawal. It was Begin, settlers note, who pledged as he took power as prime minister, that he would someday retire to a settlement in then-occupied Sinai - only to return the entire peninsula and demolish the settlements there under the 1979 Camp David peace treaty. Israel Harel, a founder and former leader of the Yesha Council and one of the most prominent voices of the movement, warned last week of the "huge ideological about-face" he said that Netanyahu had undergone. So profound is the fear that Netanyahu may commit to a sea change on the West Bank, and succeed in mobilizing the support of a consensus of Israeli and U.S. Jews, it has now spread to some of the most vocal and - until now - most unflagging of the prime minister's past admirers. Every revolution tends to believe that it is forever. Nowhere is this more evident than Israel, for six decades cradle and crucible to concurrent revolutions. But the fate of every revolutionary movement is to age, to fall prey to fissures and compound fractures, and to be astounded to find that one day, it has become history. Now it is the turn of the settlers. Though the trappings of their past success remain, their revolution is broken. The settlement movement – along with the dovish revolution whose banner was land for peace – was shattered in the chaos of the Al-Aqsa Intifada. In just six days in 2005, the single most indispensible figure in rooting settlements into the territories, Ariel Sharon, quashed a quarter century of Israeli settlement in the Gaza Strip – at the approval of two-thirds of the Israeli electorate. The settlement revolution has never truly recovered. Even as it insists that West Bank settlements can never be undone, the movement is both haunted and crippled by its own private Naqba, the loss of the dream of a Greater Israel in the Likud government's disengagement. Of late, figures of significance on the right of both the Israeli and American Jewish communities have begun to rethink the future of the settlers' core redoubt: the West Bank. As Israeli-Palestinian negotiations resumed this month, influential Washington Post columnist Charles Krauthammer astounded many colleagues on the right by observing that "No serious player believes it can hang on forever to the West Bank. "This has created a unique phenomenon in Israel - a broad-based national consensus for giving nearly all the West Bank in return for peace," Krauthammer continued. "The moment is doubly unique because the only man who can deliver such a deal is Likud Prime Minister Binyamin Netanyahu - and he is prepared to do it." The comments coincided with a number of indications of a beginning of change on the right and within the settlement movement itself. Among the more intriguing is a group of young Israelis – some of whom grew up in West Bank settlements - who have moved back into Israel to resettle the abandoned kibbutz of Retamim in the central Negev. The group includes the son of Pinchas Wallerstein, a former longtime leader of the Yesha Council, the effective government of the settlement movement. At the same time, some residents of settlements outside the blocs which U.S. officials foresee could be appended to Israel in the context of a withdrawal, have been putting out feelers to Israeli government agencies about possible compensation for voluntarily moving back to Israel in the future. Another shift in thinking is increasing sentiment for the possibility of a unilateral West Bank withdrawal outside the context of negotiations with the Palestinians. For many Israelis, this dovetails with fast-evaporating hopes for an eventual peace agreement with a deeply divided Palestinian body politic. Israeli analyst Guy Bechor, who has often argued for hardline stances vis a vis the Palestinians, wrote last week that Israel should now deliver an ultimatum to Palestinian Authority President Mahmoud Abbas: "This is your and your administration's last chance. If we fail to secure a quick agreement, where Israel's demands are recognized, we shall unilaterally evacuate most of Judea and Samaria, annex the settlement blocs and Jerusalem's Old City, and abandon you and your regime to Hamas' and Jordan's mercy. Bechor has also proposed that Israel renounce its annexation of most of Arab East Jerusalem and cede control over it. "An immense burden – on the political, defense, economic, and public relations fronts – will be lifted from our shoulders when the status of Palestinians in east Jerusalem will be the same as that of Palestinians across the West Bank," he wrote earlier this year. "This will happen eventually in any case, according to the world, so why not do it now?" Noting that Netanyahu had begun speaking of "two states for two peoples" and calling Judea and Samaria "the West bank," Harel wrote in Haaretz that many of the prime minister's critics "cannot grasp the fact that Netanyahu, via his statements, has embarked on a road from which there is no turning back." The ultimate fear is that if Netanyahu takes a position in line with Washington's vision of concessions, the Likud and the cabinet - for all its drumbeat of eternal commitment to the settlers - will go along. Since the Gaza pullout, the Yesha Council has also lost much of its influence with young firebrand activists, many of whom now dismiss the council as mashtapim [collaborators] and bourgeois. There are also fears that radical actions by young "hilltop youth," the movement's volatile shock troops, could further alienate the Israeli mainstream, adding consensus support to a West Bank withdrawal. The lack of movement toward a formalized peace accord is also spurring general Israeli interest in a pullout, based on the sense that if no action is taken soon to separate Israel from the more than 2.5 million Palestinians of the West Bank, the Jewish state will effectively become an Arab country. On Monday, speculation grew that Netanyahu was mulling a major step, when Israel Channel Two television reported that he backed legislation for a referendum on a future West Bank agreement. Apart from a possible signal of the prime minister's intentions, a referendum could blunt and overcome rightist opposition to a withdrawal. "Netanyahu's preference for appeasement is both ironic and destructive." The Jerusalem Post's Caroline Glick writes. While Krauthammer's "arrogant and false portrayal of reality is debilitating," she continues, "it is Netanyahu who is charged with leading and defending Israel." "And Netanyahu is the man who is now leading us on a path to degradation and defeat." Onlangs nog schreef Anja Meulenbelt een lang artikel over de vredelievendheid van Hamas, dat Israel al lang vrede zou hebben aangeboden maar Israel houdt liever het sprookje in stand dat Hamas haar wil vernietigen. 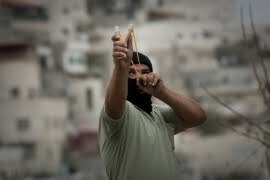 Deze film zal dus wel door de Mossad zijn gemaakt, want het vredelievende Hamas zou hier toch niet van durven dromen? It depicts the "battle to free Palestine" and includes fire on Tel Aviv and Jerusalem, and changes to Channel 2's news anchors. The video, which is particularly popular in the West Bank and Gaza Strip, was created by two Hamas operatives from Gaza and the West Bank. It shows a graphic simulation of the burning down of the High Court of Justice and the Bank of Israel buildings in Jerusalem, and cars with Palestinian flags driving across Ayalon Highway. The beginning of the video shows a Palestinian refugee saying "Inshallah, the Jihad will take back the homeland." 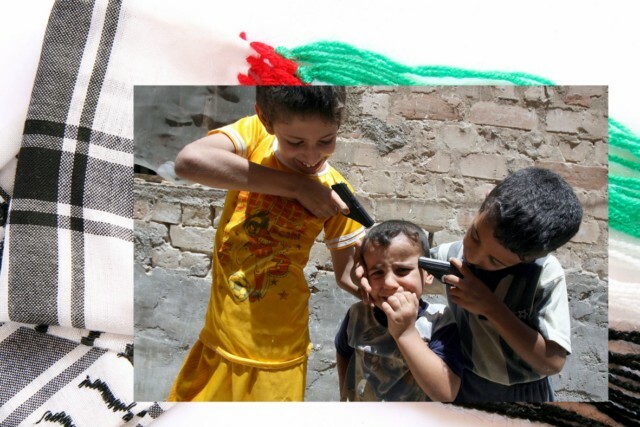 The next image is of Palestinian students telling their teacher they want to become part of the resistance; followed by an image of an armed Palestinian outlining the liberation operation. After Israel is successfully attacked and "liberated," Palestinians are shown walking along the Tel Aviv promenade and on its streets. At the pinnacle moment of the video, the opening credits to Channel 2's nightly news edition appear, but anchorwoman Yonit Levy's place is taken by a Palestinian anchorman, depicted getting ready for the news broadcast declaring the "liberation of Tel Aviv and Palestine." According to Muhammad al-Amriti, one of the video's creators, the clip was make in response to "inciting Zionist videos and videos encouraging the bombing of the Al-Aqsa Mosque. "We planned to do a cartoon, but we then decided to shoot an actual film. We hope it can be aired on the satellite stations that support the resistance," he said. His partner Eieman Hijazi, said the two used their own funds to finance the film, and urged television stations supporting the resistance to fund more films of this kind, saying he and his partner could produce such videos every three months. Een "fris en duidelijk geluid" uit Syrië en Iran. Helaas zijn zulke uitspraken niet interessant voor de Westerse media, in tegenstelling tot de enkele keer dat een Israelische rabbijn uit de bocht vliegt en de Palestijnen zijn vijanden noemt en die dood wenst, dan is dat voor de NRC Handelsblad (voor wie de *kuch* nuance zoekt) voorpaginanieuws. Following are excerpts from a TV debate on Holocaust denial, which aired on Al-Alam TV (Iran) on August 8, 2010. Syrian author Muhammad Nimr Al-Madani: "I have read everything that has been written about the Holocaust, both by those who deny it and those who claim it occurred. First, those who claim that the Holocaust took place do not have any proof." TV host: "Those who claim that it took place?" TV host: "On what do they base their claims?" Muhammad Nimr Al-Madani: "On nothing but a lie. Those who deny [sic] the annihilation have provided weak evidence. To be honest, in the West, they do not dare to speak freely..."
TV host: "Or to conduct objective research." "According to the Torah, the Lord enjoined them to conduct a seven-day sacrificial burning. The 'burning' is a sacred ritual of worship. I consider this to be proof of the falsity of the Holocaust, and biblical evidence that they have drawn the lie of the Holocaust from the Torah. Their reliance upon the Torah proves that the Holocaust is a lie, and that it never happened. It also shows that the Holocaust doctrine is deeply engrained in their minds and in their rituals." TV host: "On page 64 of your book, for example, you write that the Old Testament describes with great accuracy how to build a crematorium." Muhammad Nimr Al-Madani: "Yes. There is a text describing how to build the temple for the crematorium - its pillars, its copper ornamentation, and so on." TV host: "It describes the crematorium in detail." Muhammad Nimr Al-Madani: "Yes. For example, its size is approximately 2 meters. Bear in mind that the incinerators in the German Nazi hospitals, in which they burned the bodies of the sick, were 2 meters, or 190 centimeters. This is similar to the incinerators which they consider to be crematoria." TV host: "On the inner cover of the book, we read a quote by President Mahmoud Ahmadinejad. Why did you decide to print a quote of Ahmadinejad? This is..."
Muhammad Nimr Al-Madani: "Can we present it to the camera... I was very happy when the Iranian president denied the Holocaust. Since I am convinced of the need to fight this lie, I was filled with admiration at the words of the Iranian president." TV host: "He said: 'Israel should be wiped out of existence.'"